This process offers religious formation for children from 3 years old through 6th grade. Children are dismissed from the worship space before the mass begins and return to join their families at the offertory. While the adults are listening to the readings and the homily, the children are doing the same, but at their level of understanding. Then the Catechists break open the Word with the children through discussion or activities focusing on the teachings of the Church and how to live out our everyday lives as we follow Jesus' instruction. Our process begins in September and is available throughout the year. Registration is held during late August and early September, but new families are invited to register any time . Families joining the process after registration will need to meet with a staff person to learn how to work with their children at home. There is a charge for the materials. ($45 for one child, $60 for two children, $75 for three or more children for parishioners; $80 per child for non-parishioners. We recruit for new catechists four times a year and the availability of grade level sessions at each mass is based on the number of people who come forward to share the Word with the children. Training is provided for all people who would like to be part of this ministry at the beginning of each quarter. (Winter Quarter – December, January, February; Spring Quarter – March, April, May; Summer Quarter – June, July, August; Fall Quarter – September, October, November). These drop-in programs are provided to begin to familiarize children with the Liturgy of the Word. The children work with the Gospel story, do a fun activity and have prayer time. Please drop children off before Mass downstairs in room 101 or 102 and pick them up in the Gathering space after the Homily. The program is held throughout the year. The availability of classes is based on the number of people who come forward to share with the youngest members of our community. Training is held before the beginning of each quarter. All materials and lesson plans are provided. Children can join the sessions at any time throughout the year. There is no charge for these sessions. Artistically illustrates the journey of Christian life. The Doors to the church symbolizes that Christ is “The Way, the Truth and the Light” “Christ is the Sheepgate”. The beginning of Christian Life starts with baptism, so symbolized by the Baptismal Font on the upper level of the church. The Tree of Life begins at the font pool (where a neophyte would step out of the baptismal waters.) A blue border, symbolizing baptism, continues throughout the expanse of the church. Here the blooms of the Tree of Life on the stained concrete are close together, immature growth. A repeating stylized cross speaks of our constant need for our vision to be fixed on the cross of salvation. The primary symbol of Christ, anchors the large sanctuary, seating 1200 people. It is six foot square made of mahogany with the same Tree of Life motif throughout the worship space. Purple heart wood accents the Tree of Life carving. Imbedded in one of the columns is a relic of St. Francis of Assisi, a gift to the people of Spirit of Christ from Frank and Delores Connell. The liturgical name for pulpit or lectern. A worthy, sacred place is important for the place of proclamation of the Word of God. This hand carved ambo is made of mahogany, oak and insets of purple heart wood. The Tree of Life theme is carved on the legs and an arch is incorporated into the center design reminiscent of the arches prominent in the architecture of the church. The table may be lowered to accommodate readers in wheelchairs. Wheelchair access to the ambo via the processional ramp. Made of solid bronze, the water cascades down the bowl, making the primary symbol of baptism accessible to the smallest of Christians. The pool sits under one of the 2 monumental arches. The Celebrant and person for baptism descend 2 steps into the 24 inch deep pool; they exit the pool into the church proper and so begin their journey of Christian faith. This architectural moment gives us an experience of the Divine; God is transcendent, almighty, powerful, all-knowing; the 35 foot high, grand and glorious arch; light streaming in from all sides, suggests this experience of God. The arch is one of the oldest forms of architectural construction known to human kind. There is a monumental arch on each of the north-south axis of the church. The symbol of Christ’s victory over sin and death. This cross is made of stained glass continuing the Tree of Life theme throughout the church. The arms of the cross end in buds that symbolize a growing, living faith. The wood of the cross suggest the wood of the cross that Jesus died upon, it reminds us that this was an instrument of death. The shining, colorful, glass and the overall beauty and grandeur of the cross suggest the triumphant victory of life over death. The theme of the “The best of the old and the best of the new” continues with the wood inset into the cross. The 25 year old cross that was used in the old church for Lent, was venerated on Good Friday, was used in Passion Plays, was shipped to Wisconsin where the new cross was fabricated. The wood from the old cross was incorporated into the design of the new one. The symbol of the Heavenly Jerusalem, the place of honor for the reserved Eucharist. It is housed in a shape resembling the shape of the church, angled roofline with an arch forming the four sides with etchings of the Tree of Life advancing vertically. The Tabernacle is part of the Journey of Life that proceeds through the axis the church. This art glass continues the Journey of Life that proceeds through the axis of the church. Beginning at the Processional Doors, through the Baptismal Font, sustained by the Word of God at the ambo, nourished by the Eucharist at the altar, to the Tabernacle, The Eucharist, the symbol of the purpose of our life, to reach the Heavenly Jerusalem - from there the art glass continues the Tree of Life motif but at the top of window, the tree stops and as does our life upon reaching our heavenly home, the glass explodes to sparkling bubble glass. The culmination of the journey of our life ends with the scripture verse at the very top of the physical end of the church, “The Spirit and the Bride Say, “Come.” taken from the last paragraph, of the last chapter, of the last book of the Bible, at the end of time, when the Son hands all of the cosmos over the Father. Our journey is complete. These hanging candelabras symbolize the Spirit of Christ as experienced by the “tongues as of fire” descending upon Mary and the apostles on Pentecost. On the font side of the church are 7 candles, symbolizing the 7 sacraments. On the tabernacle side of the church hang 5 more. Each candelabra is made up of stacks of triangle cut plate glass with insets of stained glass in the frame. Each candle has a counter balance so that the candle may be pulled down to change the candles weekly. These are used as votive candles. In the church office is a calendar for each of the 12 candles, upon which people may register the name of a loved one who has died, or their special prayer intention, for a small donation to cover the cost of the candle. The candle will burn one week for this intention. There are 77 arches throughout the church. Each one has a keystone, made of pre-cast concrete that symbolizes Christ, the stone that holds our faith and our lives together. There are 4 Dedication Stones and Candles on the perimeter walls of the church and 2 on each side of the entrance area (the baptistery.) At the Dedication of the new church on October 5, 2001, these stones were covered with Holy Chrism, dedicating this church to God. The candles are lit on the parish feast day, Pentecost and also the anniversary of the Dedication of the Church, which is celebrated as a solemnity for the Spirit of Christ Catholic Community. Symbols of the Holy Chrism (in the Waterford Crystal carafe placed on the pedestal), the Oil of the Sick and the Oil of the Catechumens are etched into the glasswork of the ambry designed by the late Regina Adducci. It graces the baptistery area. These 15 stations are cast of solid bronze, full of artistic and spiritual mystery yet crafted with breathtaking detail. This is the 14th Station, Jesus is Laid in the Tomb. The artist captures the overbearing emotion felt by the mother of a her shrouded son in her arms, by the panels surrounding her, pressing in on her, yet probably suggesting the tomb he will be laid in. The crown of thorns sits beside him, probably taken off of him by his mother. She touches him as if for the last time while covering her face in unspeakable grief. The artist requested to remain anonymous but that any adulation be given to the honor and glory of God. 18 arch windows surround the perimeter of the church, all of which enshrine an "etching" of a saint. The art is by Katharine Wolf from Switzerland. 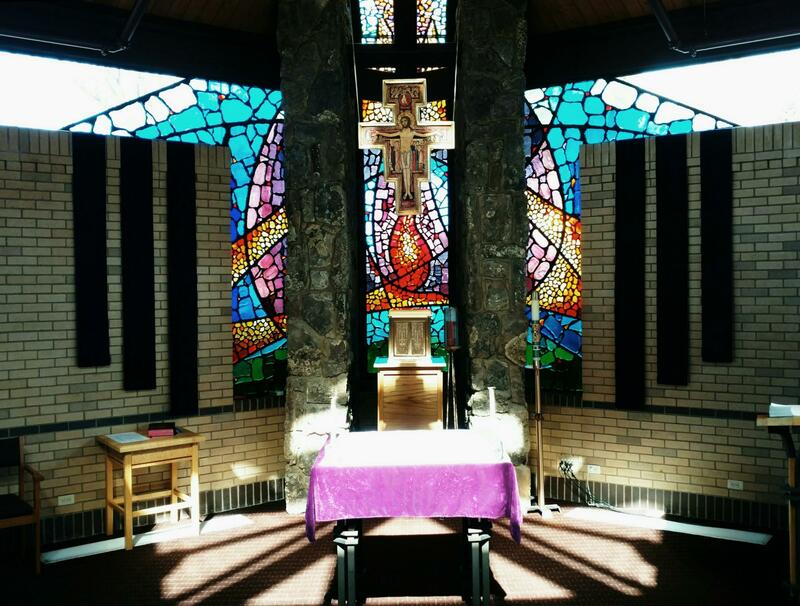 This is a sacred space surrounding the entrance to both the church and the chapel. St. Francis of Assisi and the wolf of Gubio, stand as a symbol of peace, Patron Saint of the State of Colorado, so designated by the Archbishop of Denver, since the tragedy at Columbine High School in 1999. Near the statue of St. Francis is a time capsule buried in 2000 to be opened in 100 years. Before the time capsule was placed, guns were buried as a sign of our commitment to non violence in the new millennium. At the Easter Vigil on Holy Saturday, a roaring fire is lit in this marble sculpture (which used to be the Holy Water font in the old church) and graces the east terrace. The candidates, catechumens and the ministers of the mass gather around as the fire is blessed and from it the Paschal Candle is lit. It has been a 25 year tradition at Spirit of Christ to have the words to songs sung at Mass projected onto a screen making it possible for heads to be uplifted in song. It saves the expense and waste of producing paper worship aids Sunday after Sunday and with the equipment in the AV Booth, makes it possible to use videos, slides, and Power Point presentations. Having the words to the songs on a screen was one of the core values the people of Spirit of Christ asked to be incorporated in the construction of the new church. The new church seats 1200 people but many liturgical events call for a more intimate setting. This pentagon-shaped, 175 seat chapel serves as the venue for daily Mass, many funeral vigils and small weddings. The clerestory made of glass gives the appearance of the roof floating above the brick walls. The pentagon shape is symbolic in that “five” is an ancient symbol for healing. This depiction of our Blessed Mother is the artist’s rendering of her at about the age she would have conceived and born baby Jesus. It was hand carved in Italy and is one of the few liturgical appointments that was used in the old church. The statue is in a small L-shaped alcove on the baptismal font side of the church.